Don't forget to go out to your favorite local burger joint for lunch or dinner on September 18 as it is the National Cheeseburger Day. Cheeseburger is a variation of hamburger topped with cheese. Hamburgers with added cheese became popular in the late 1920s. There are different theories about the origins of cheeseburger. 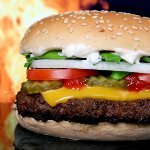 Credit for the invention of the cheeseburger is mostly given to Lionel Sternberger. In 1926, 16-year old Sternberger was working at his father's sandwich shop in Pasadena, California. He experimentally dropped a slice of cheese on a sizzling hamburger. Traditionally, the slice of cheese is usually placed on top of the frying meat patty shortly before the patty is completely cooked so that the cheese starts to melt. In fast food restaurants, cheeseburgers usually contain processed cheese. But they can also be made with cheddar, mozzarella cheese, Swiss cheese, pepper jack, and blue cheese. Other ingredients can be added such as bacon, tomato, pickles, onion, avocado or guacamole, sautéed mushrooms, chili sauce, ketchup, mayonnaise, mustard. Cheeseburger typically have a higher nutritional value than hamburgers because cheese adds calories and saturated fat to a burger. A cheeseburger can contain more than one slice of cheese and more than one patty.